Scanning has never been easier, just sync with Bluetooth and you are ready to start. With the OPN2006 Barcode Scanner you don't need difficult programs or configure settings. Just link the bluetooth scanner to your phone, tablet or system and the companion scanner will do the rest. Whatever the situation, OPN-2006 makes life easier. OPN-2006 from Opticon is a very versatile product and its uses vary from small stores to bigger companies for their inventory management, asset tracking, visitor registration and much more. The companionbluetooth scanner can be used to register visitors at a festival entrance and provides feedback if the barcode is valid or it may be used at retail point-of-sale to keep track of inventory. The OPN scanner is straightforward and therefore it is suitable for many applications. 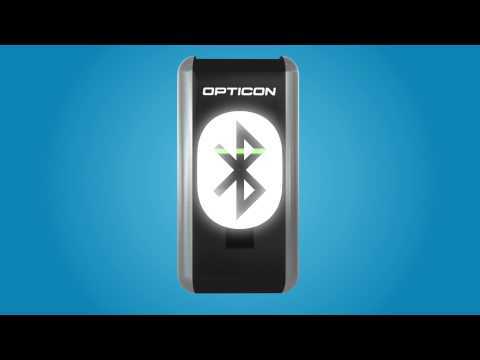 The Opticon OPN-2006 is a small and lightweight companion scanner that fits easily in your pocket, making it easy to take it anywhere. The scanner is set up with Android, Apple, Blackberry or Windows mobile through Bluetooth 4.0 or Bluetooth Low Energy (BLE). With this Bluetooth connection it ensures you of real-time data sync with your computer or system. This means that your system is always up-to-date with the right data. When no connection is available the scanner holds up to 20.000 scans that will transfer to the system through the complimentary USB-cable. You can customize the OPN-2006 using a free Software development kit. The quality 1D laser scan engine inside ensures possibility of a 100 scans a second. The OPN-2006 provides audible and visible feedback after a successful scan. The scanner does not require any technical know-how to set it up and the set-up only takes a few minutes. This device is proven to be a reliable and quick scanner that makes life easier. OPN2006 Compact Bluetooth Companion 1D Barcode Scanner With USB Charging Interface.